Tilde Binger of Copenhagen designed this free pattern with the permission of Diana Boston, based on the famous patchwork created by Lucy Boston. Tilde created this pattern for anyone wondering what to do with the diamonds, triangles, and squares in the FREE Inklingo shape collection, and it is perfect! You can make a table runner or a larger quilt and become familiar with the features of Inklingo. Passacaglia is a Baroque musical form. Music was important to Lucy Boston all her life. She interpreted the form of a Passacaglia in fabric. The bass line is the background fabric and the four stars, which are always in the same positions. The melody is the placement of color, which changes from block to block. It was the perfect gift for her friend, Colin Tilney, a brilliant harpsichordist. Lucy Boston's Passacaglia is described and illustrated in Diana Boston's book, The Patchworks of Lucy Boston. 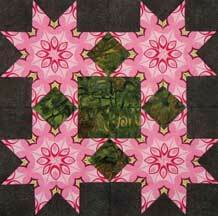 See several more of Tilde's stunning Passacaglia variations on her blog. 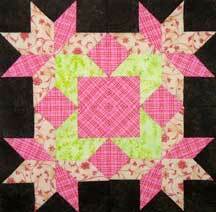 The pattern is suitable for scraps and nickels, and it includes suggested cutting layouts and many optional extras. 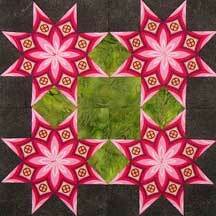 Tilde also has other patterns available on her website. A NOTE ABOUT CONFUSING NAMES! 4. Tilde in Denmark called her table runner patter Passacaglia several years ago too.